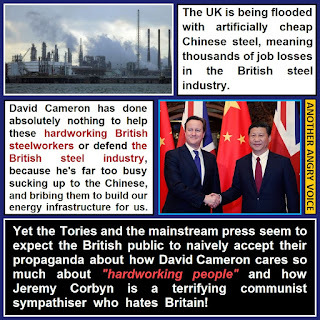 The UK steel industry is being ruined by a tidal wave of artificially cheap Chinese steel. Now that Tata have decided to abandon their UK steel operations tens of thousands of jobs are on the line. The response from the Tories is absolutely pathetic. The business secretary Sajid Javid knew this announcement for Tata was coming but he decided to lord it up at a black tie dinner in Australia instead of do anything useful to help the UK steel industry. David Cameron also knew it was coming, but he decided to continue enjoying his relaxing 17 day holiday in Lanzarote until he was shamed into returning to the UK. He obviously didn't return because he wanted to, or because he thought it would be the right thing to do. He came back because he knew it would be a PR disaster if he didn't. The Labour opposition have worked hard to pressurise the Tories into doing something to support the British steel industry. Jeremy Corbyn's petition for David Cameron to recall parliament so that the government can be held to account for their inaction rocketed past 100,000 signatures within a day of its launch. The Tories are determined to stick to their crackpot Laissez-faire ideology that "state intervention in the steel market is wrong". They're flat out refusing to consider renationalisation of the steel industry and they even voted against an EU move to allow increased import tariffs on artificially cheap Chinese steel in February 2016. Even when the UK steel market is facing an existential threat from the state controlled Chinese steel market, the Tories are still absolutely determined to stick to their ridiculous "state intervention is wrong" Laissez-faire ideology. It's now completely obvious that the privatised UK steel industry can't compete with the vast state controlled behemoth of China which produced more steel between 2013 and 2014 than the entire output of the UK steel industry since 1870! The choice for the UK is simple. The state has to intervene in order to save one of our core strategic industries from complete annihilation, or the Tory government deliberately sacrifice it on their altar of Laissez-faire fundamentalism, which would make the UK entirely dependent on imported steel, no matter what the future price, putting our entire economy in a dangerous position of weakness. It's absolutely clear that as far as the Tories are concerned, the tens of thousands of people who work in the UK steel industry and related trades are virtually worthless sacrificial pawns. Why would they give a damn about industrial workers? After all, most of them don't vote Tory do they? 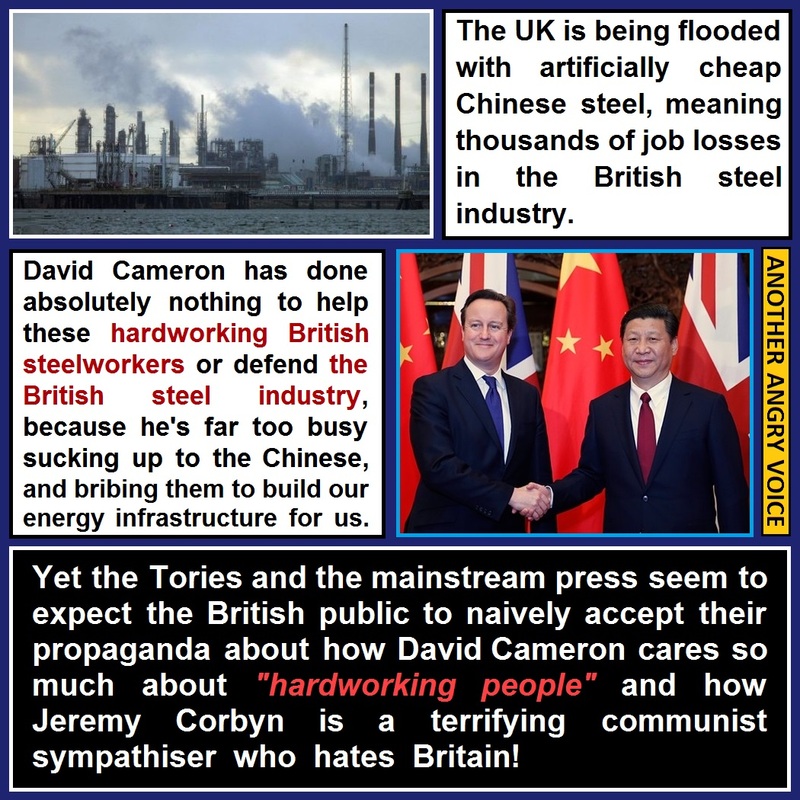 A much bigger objective for the Tories than protecting a vital UK strategic industry, and the tens of thousands of jobs that go with it, is their policy of pathetically sucking up to the Chinese. Why else would they have voted down the EU measure to allow states to increase import tariffs on artificially cheap Chinese steel? Anyone who is familiar with the Britain First Facebook page will know that when they're not busy trying to scam money out of people, they fill their timeline with outrage inducing content designed to stir up hatred against Muslims, the EU, lefties, liberals, refugees ... all the usual scapegoats of the right-wing press. In March 2016 Britain First really surpassed themselves by posting an obvious spoof article about how the EU is supposedly forcing the Essex villages of High Easter and Good Easter to change their "offensive" names. Hundreds of Britain First followers shared the article as if it was a serious story and hundreds more left furiously outraged comments, spewing their reactionary bile and hatred for Muslims, the EU, immigrants, liberal, and lefties. "Wonder who it offends ?? Could it be the work shy moaning mussies ??" "Who the hell is running this country, bloody muslims, these little .jobworthys ought to be sacked and deported to who they work for anybody bar the english"
"We should complain and get all mosques closed down. They are offensive to look at. I bet the council would not even consider it! Time to start doing 'things' ourselves." "Muslims get out of our country now, we are so weak to these invading foreigners"
"Things are going to far taking everything that's British away from us next will be the English breakfast"
"These f*cking PC nutter's want naming and shaming for trying to erase culture and heritage of High Easter and Good Easter. To think the people who live there are paying for these idiot's golden plated pension's through their council tax." "Offensive to who..? ?certainly not the English the rightful indiginous population...whose customs rights and religion are engrained.in our souls our characters..our religion Christianity is what out countrys laws and Western way of life is based on..Any other religions or ideologies in our country.is and allways has been forign to our native country and any acceptence of their requests and implimenting them is totally illegal to artical 61 in The Magna Carta." "These liberal fools. ... Unreal." "well islam offends me. lets outlaw that." "I bet no one has complained, its the spineless lefty toads complaining on behalf of people who dont have a problem, that would be my guess"
"It may upset certain types but there not to quick to not take benefits or houses"
" ... stop this cultural genocide"
"And I say to Connor wibbly we are a christian country and we have christian values. It's not forced down our necks we enjoy it. Are you going to demonstrate to have mosques removed ?" There are some real gems of foaming-at-the-mouth right-wing idiocy in this tiny selection of the hundreds of outraged comments, but the last one is a real peach. The name-drop shows that the guy who posted it has actually read the article where the only quoted sources were Dr Malcolm Touchi (supposedly "an expert in Domicile Perception Law from the University of South Thurrock"!) and Connor Wibbly (who was quoted as saying "there will naturally be plenty of critics, but I have one question to ask them: How many towns in the UK have the word ‘Hannukah’ or ‘Ramadan’ in them? Hardly any is the answer!") and concluded that it wasn't a spoof article. If the ridiculous names, occupations and quotes weren't enough, the amusing conclusion that the town of Christchurch would be facing double the "compensation payouts" for containing two Christian words was surely such an obvious clue that the article might not be entirely serious that only the deeply credulous (or those who didn't even bother to read the article before writing outraged comments about it) could ever fall for it. It's probably no surprise to find out that a UKIP page also posted this spoof article as if it was a serious news item, and that it provoked a slew of outraged comments from 'kippers too. The UKIP Warrington page that posted it is an extraordinary page that spews a cognitive dissonance inducing bombardment of anti-European, anti-Scottish, anti-austerity (they like sharing UK Uncut infographics), anti-Muslim, anti-Tory (several articles from the left-wing news site The Canary) and anti-refugee posts. "We are losing all our christian identity and for what to be taken over by extreemists who probably do not pay anything into the county only take what they can. Right lets see what affends me Burka,Mosques, praying with their asses in the air in the street can we have all these banned please"
"if this country changed our bennifits to merry xmas bennifits,and easter bennifits, do you honestly think it would stop them from claiming them!" "So are we supposed to wipe this old village from the map to satisfy fanatical terroist and invaders ?? be better and more useful to eject the invaders and block the benifits and forign aid"
"If we carry on like this there will be a civil war"
"we are a christian country not a muslim country or seihk country .and they have had this name for centuries .this is political correctness gone mad .another reason to leave eu ." "The leftie fascists are winning." "Most councils now have muslims this should not be alliwed in the UK." If anything, this outpouring of extraordinarily gullible and hate-filled comments from UKIP Warrington followers displays even more shocking levels of intolerance and atrocious writing skills than those from the Britain First lot. It's tempting to just laugh at the gullibility of the right-wing permanent outrage brigade because it is pretty funny that so many of them fell for such an obvious spoof, but there is actually a serious issue to consider. Britain First now has over 1.3 million followers, and literally millions of people see the shameless ideological shambles that is UKIP as a serious enough political party to actually vote for them in elections! 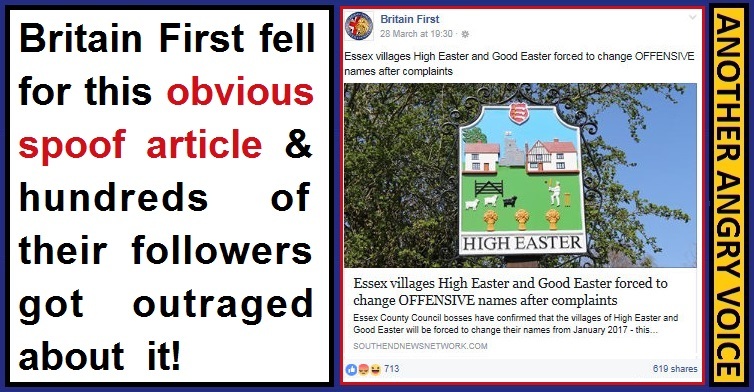 Of course a few people are following the Britain First page just to laugh at the idiotic comments, a few more were duped into liking the page with cynical honeytrap images, but the majority clearly like their daily bombardment of extreme-right hatemongering. Back in the 1930s the British people rejected Oswald Mosely and his British Union of Fascists (even though he was strongly backed by the tabloid press). In October 1936 the people of London came together in solidarity to give Mosley and the BUF a kicking they never recovered from at the Battle of Cable Street. Then the people of Britain spent years and made countless sacrifices in the Second World War during the fight against fascism on the Continent. Despite all of the bravery and sacrifices of our forefathers, the extreme-right is undeniably back in fashion, so how did it come to this? In my view the answer is twofold. The first is the way the English education system teaches kids that easy answers are dripped down from authority to be rote learned and regurgitated on demand. Only a tiny fraction of the 93% of us who go to state schools end up with anything resembling a decent education in vital subjects like critical thinking, philosophy and basic economics that would allow us to see through crude political propaganda (or to spot an obvious spoof article for what it is!). The second factor is the dominance of the right-wing press. The UK has the most right-wing biased press in Europe owned by a tiny bunch of extremely right-wing tax-dodging billionaire sociopaths. Our right-wing tabloids, which are still read by millions on a daily basis, are deliberately written in childishly simplistic language and feature the repetition of familiar recurring tropes over and again (like children's television does). They are written like this so that even the most intellectually stunted people can read, absorb and repeat the propaganda themes they contain. If you take a huge demographic who have been badly failed by the education system and then drip feed simplistic right-wing tropes for decades, the obvious consequence is that they're eventually going to be attracted to the even simpler offerings of outright fascism. Once the political establishment decided that the best way to keep the British public passive and servile would be to systematically deny them the thinking skills they need to see through the right-wing political propaganda they're being drip-fed, it was only ever going to be a matter of time before someone else (like Britain First or UKIP) comes along with even simpler and more enticing right-wing propaganda narratives in order to turn this demographic against the political establishment that wanted them that gullible in the first place. Now that it's becoming obvious that this is happening, the political establishment has the choice of either moving further towards outright fascism in order to appease this huge demographic that they deliberately created, or doing something to begin trying to undo the immeasurable damage that has already been done. Given the appalling legislation on the table (new spying powers that would have made the Gestapo turn green with envy, economically insane deportation policies for working people, a massive crackdown on the feeble vestiges of trade union power, abolition of the right to free speech, the banning of intellectual opposition to the government, numerous forced labour schemes and the forced privatisation of the entire English education system into the hands of unaccountable private sector pseudo-charities, all of it backed up by a barrage of shockingly Orwellian propaganda) it's absolutely clear which direction the Tory party have decided to move in. I guess the best conclusion I can offer is an apology. I'm sorry that I've taken something that's actually pretty funny and pointed out the deeply sinister undertones. I guess one small way that we can fight back is by actively confronting our Facebook friends if we ever see them sharing extreme-right or UKIP posts. Another way to fight back would be to confront any Tory voting friends and family with some of the disgusting policies they've been pushing (see the list above) and asking them to actually defend them (without resorting to tiresome "but Labour ..." whataboutery). In January 2016 the Tories succeeded in putting the ridiculously anti-scientific and irrational Psychoactive Substances Act onto the statute books. 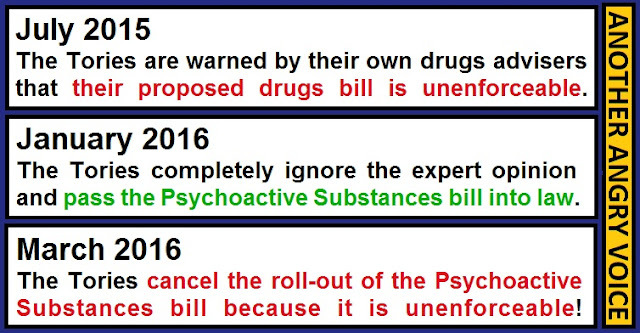 This ludicrous and highly controversial piece of legislation which bans the use of substances that don't even exist yet was due to come into force in April 2016 but it has been postponed indefinitely because legal and medical experts alike have told the government that it's so poorly written that it's literally unenforceable. The Psychoactive Substances Act was modelled on a similar "screw the science - let's ban everything" piece of legislation that was passed in Ireland. The evidence from Ireland is damning. The Irish "let's just ban everything" bill that was introduced in 2010 led to a dramatic increase of synthetic designer drugs usage from 16 to 22% of the teenage population. Since the ban Ireland has experienced the second fastest rate of increased synthetic designer drug usage in the entire EU, and by far the highest overall rate of usage. Any politician who gives the remotest damn about the legislation they are voting into law must surely consider the consequences of the original bit of legislation it is designed to copy. However it's absolutely clear that hundreds of Tory MPs didn't scrutinise the evidence at all. All those MPs just voted in the way Theresa May told them to regardless of the stack of negative evidence. If anyone needed any further proof that the right-wing authoritarian prohibitionist mentality is based on ideology and not evidence, then this is it. The Irish evidence shows that hardly anyone has been prosecuted under their version of the bill because of difficulties over the term "psychoactive". Unless an expert can be found to prove that the novel compound actually does produce a psychoactive effect, then the prosecution could never succeed. It's not like it's any kind of surprise that this staggeringly inept piece of legislation is unenforceable, the Tories were warned by their own drug advisers that it would be unenforceable in July 2015, long before they decided to vote it into law regardless. The fact that Theresa May completely disregarded the concerns of the government's own drugs advisers and pushed ahead with this utterly flawed piece of legislation is bad enough, but the fact that her fellow MPs simply voted such idiocy into law because they were told to by the party whips is probably even worse. The gobbledygook legislation leads to a bizarre situation that the first research into the effects of novel compounds that people are taking for recreational purposes won't be to determine whether they're actually safe for human consumption, it'll be to determine whether the compounds have any "psychoactive effects" in order to provide evidence to support prosecution of the vendor, regardless of whether the compound is actually harmful or not! A piece of legislation which generates such warped research priorities is clearly absurd. However what is even more absurd is the way that Theresa May and the Tories have set the propaganda narrative that this dangerously incoherent, anti-scientific, evidence-ignoring, weird priority creating rubbish is necessary in order to "protect the public". The ban in Ireland led to a wave of closures of so-called "head shops", but the huge rise in usage since the ban came into effect (as detailed above) proves that the ban simply drove the market for novel psychoactive compounds underground. The rational drugs policy argument is that the sale of recreational drugs should be legalised, taxed and regulated. The tax money could be used to conduct research into the actual effects of the drugs (harms, addictiveness, safe dosage levels etc), provide unbiased safety information for users, enforce market regulation andprovide rehabilitation for the minority who become problem users. Even after taking those costs into account there would be plenty left over from the taxes raised to contribute towards other socially beneficial things like the NHS or the education system. Nobody sane is arguing for a drugs free-for-all where powerful psychoactive compounds and addictive substances are sold alongside the kids' sweets in supermarkets. The ideal places would be licensed and regulated pharmacists and "head shops". The prohibitionist ideology results in drugs market being handed over to criminal gangs with no compunctions about selling to children and vulnerable people, drug pushing, hawking adulterated substances and dangerously irregular doses, and pay no tax on their profits either. Surely if "head shops" are selling potentially dangerous substances, then the rational solution would be to regulate them, rather than introducing legislation designed to put them out of business and transfer control of the entire market to completely unregulated and untaxed black market gangs? Why do novel designer drugs even exist? Even if we neglect the fact that this botched piece of legislation is so incoherently drafted that it's unenforceable, the slightest examination of the claim that it's meant to crack down on dangerous "legal highs", presents a huge problem for the ideologically driven prohibitionist to explain. It's beyond doubt that the rise of synthetic drugs like Spice are a direct consequence of the prohibition of drugs like cannabis (the naturally occurring substance that Spice has been designed to imitate). If people are taking potentially harmful synthetic drugs to imitate the effects of a relatively harmless naturally occurring substance that humans have been consuming for at least ten thousand years, surely the sensible solution is to end prohibition of the relatively harmless substance rather than hand control of the market for the synthetic substitute over to unregulated, untaxed criminal gangs too? In seeking to further criminalise people who take psychoactive substances the Westminster political class are swimming against the political tide. Despite decades of fearmongering lies and rhetoric in the pages of the right-wing press, utterly bizarre government propaganda campaigns and absurd anti-drugs propaganda dressed up as independent drugs advice from organisations like Talk to Frank, public opinion is gradually moving against ideological prohibitionism and towards rational drugs policies. The legislative tide is turning across the world. Several countries have decriminalised drug use and others have gone further, fully legalising the use of previously banned substances. Uruguay has fully legalised cannabis, Portugal has decriminalised all drugs (leading to a rapid decline in crime and drug related deaths), possession of small amounts of drugs has been decriminalised in Ecuador, the Czech Republic and Costa Rica too, Argentina has recognised the right to take psychoactive substances as a constitutional right, and even in the US (the country that pushed ideologically driven prohibitionism on the rest of the world in the first place) cannabis has been fully legalised in five states, decriminalised in fourteen other states and decriminalised for medical use in eleven others. In October 2015 the United Nations were due to announce a relaxation in their stance on recreational drugs use, but apparently one country vetoed the change of policy towards the decriminalisation of recreational drugs use. It wouldn't surprise me at all if the country that vetoed the policy change announcement was the United Kingdom, given the way the Westminster establishment seem so desperately keen to swim against the global tide that is flowing towards rational drugs policy and away from ideologically driven prohibitionism. The fact that such an absurdly incoherent, anti-scientific, evidence-ignoring and unworkable piece of legislation found its way onto the statute books in the first place is damning evidence of Theresa May's incompetence, and the pathetic way in which Tory MPs vote stuff into law without even listening to expert opinion or thinking about whether the legislation is even coherently written, simply because they're told to by the party whips. Not only are the Tories determined to swim against the tide by bringing in even more ideologically driven right-wing authoritarian prohibitionist policies while much of the rest of the world has finally started listening to expert opinion and begun moving towards rational drugs policies, the legislation the Tories have come up with is so incoherently drafted that it's literally unenforceable! Ending the ideological "war on drugs"
I don't often frequent the political cesspit that is the Conservative Home Blog, but I was pointed in the direction of an article entitled "How a government can beat the BMA" written by the site's deputy editor Henry Hill. Before I get to explaining the Tory blueprint for tearing apart our public services, I'm first going to look at what this blog post tells us about the rotten Tory mentality of the author. Before we even get to the contents of the article, it's clear from the title alone that the author is of the stunted Tory class war mentality, where workers and trade unions are the enemy, and any kind of compromise or co-operation between employers and workers is political weakness. This rotten and destructive class war mentality completely dominates Tory politics because they consider their ideological assault upon the trade unions in the 1980s to be one of their greatest victories. It doesn't matter a jot to these people that the UK keeps lagging further and further behind Germany, where trade unions and employers generally co-operate for the best of their industries rather than retrenching into destructive ideological class war at the first opportunity. As far as most Tories are concerned, trade unions and ordinary workers are always the enemy and if disputes don't come about naturally they can always be deliberately provoked (as with the junior doctors contract and the force privatisation of every school in England) in order to bring back the ideological class war struggle they crave for. The class war mentality of the author was clear from the title, but the actual contents reveal the sheer scale of his absurd class war obsession. The article is peppered with references to the Miners Strike in the 1980s. The author tries to imagine Jeremy Hunt as a victorious Thatcher figure destroying the power of the British Medical Association (and presumably condemning their industry to destruction in the process, as was the case with the coal miners), he draws tortured parallels between the Junior Doctors' strike and the Miners' strike and concludes chillingly that "one day the BMA will have their 1984". Comparisons between the Miners' Strike and the dispute over the Junior Doctors contract are obviously utterly facile. The Miners' Strike came about as a response to the existential threat against the mining industry. At the time right-wing people sneered at the idea that the objective of the dispute was to kill the mining industry in order to destroy the power of the NUM trade union. By December 2015 the very last deep coal mine in the UK at Kellingley was closed down and the once powerful NUM had shrunk from 170,000 members to fewer than 100. The idea that a similar fate can be imposed on the medical profession is utterly laughable. The Miners' Strike concerned pretty much the entire coal mining industry, the Junior Doctors dispute only concerns a small fraction of the total NHS staff. The Miners' Strike was a full scale strike that crippled the industry and lasted almost an entire year. The Junior Doctor's strikes have been a series of short strikes with cover provided by other medical professionals to ensure patient safety. Margaret Thatcher used the police as her own personal militia in order to attack the mining communities of the UK. The idea of David Cameron sending the police in to violently oppress a bunch of doctors is clearly ludicrous. There is a strong global demand for medical professionals. If the Tories do successfully manage to crush the BMA and destroy the working conditions of NHS workers, unlike the striking miners, medical professionals have many more opportunities to move somewhere like Canada or Australia where they would be treated with a little less contempt by their government. Anyone drawing parallels between these two staggeringly different examples of industrial action is clearly living in cloud cuckoo land. Before I get to outlining the details of the Tory strategy to privatise the NHS, I'm just going to detail one more thing that highlights the rotten mentality of the author. Henry Hill has a big whinge about the NHS saving people's lives as if preventing people from dying is not only some kind of economic crime, but an act of cruelty against the individual who has been saved from death! "Anybody who the NHS 'saves' from a tobacco or food-related deaths will die of something and the NHS will pay for it. If that person is forced to live a long life, they will likely end up costing the NHS more than they would had they died younger." The idea that the NHS is somehow forcing people against their will to live longer is utterly absurd and an insult to anyone unfortunate enough to read such drivel. Of course people are likely to continue using the NHS if they're not shovelled into an early grave, but it's not beyond the bounds of reason that they will continue working, contributing to their family life or to their local community in some way too is it? Reducing people's lives down to a balance sheet consisting of nothing more than their costs to the health service is a perfect example of the Tory "price of everything and the value of nothing" mentality. There are four main prongs to the strategy Henry Hill details in his blog post. Diluting the workforce with unqualified staff, removing the right to take industrial action, breaking up the service into many separate employers and drip-feeding the destruction of the NHS slowly so that the public are less likely to notice. The author suggests that most of the work doctors do is easy and could be done "by a physicians' assistant with a fraction of the training or wages". He then goes on to fantasise about a health service filled out with well-meaning volunteers based on the Territorial Army model. A health service increasingly staffed by low-skill, low-paid workers and well-meaning volunteers doesn't seem to be a recipe for efficiency to me, but then it just depends how efficiency is defined doesn't it? If quality of service isn't included as a measure of efficiency at all, then the lower the staff costs the more efficient the service. The author wants to see medical professionals stripped of the right to take industrial action like soldiers and the police. If that proves unpopular, then destruction of the right to strike can be achieved in other ways. One is to attack the right to strike at source by introducing a Trade Union Bill designed to make trade union democracy completely unworkable by rendering an abstention as a stronger vote against strike action than an explicit vote against strike action. 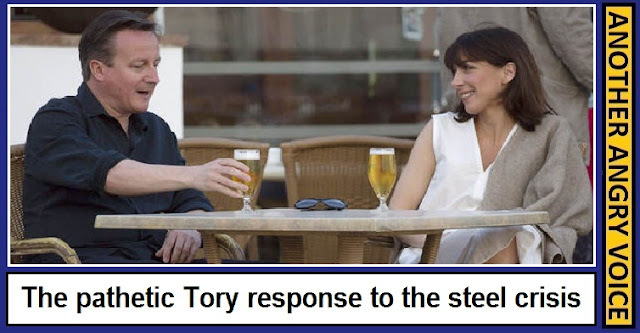 Another method is the third prong of the Tory attack. Breaking the NHS up into many separate employers would remove the power of collective bargaining and render attempts at cross-NHS strikes "sympathy strikes", which were outlawed when the Tories introduced the harshest anti-worker trade union rules in western Europe back in the 1980s. Other benefits to the Tories (and the private health investors who bankroll them) is that smaller chunks of NHS services are not only easier to privatise, it also makes it much easier for private corporations to cherry-pick all the profitable pieces for themselves, whilst leaving the unprofitable bits for the taxpayer to run. The 2012 Health and Social Care Act was a masterclass in the privatisation by stealth strategy. The former Tory party leadership candidate Michael Portillo once explained why this plan to carve the NHS open for mass privatisation wasn't even mentioned in the 2010 Tory manifesto. He said it was because "they did not believe they could win an election if they told you what they were going to do". Even now there are still an awful lot of people out there who are so misinformed that they scoff at the idea that the NHS is being steadily privatised and NHS facilities turned over to the treatment of private patients. Through their policy of deliberately under-reporting the Health and Social Care act and the subsequent waves of privatisations, the mainstream media have been complicit in fostering this all-too-common public mentality that the ongoing privatisation of the NHS is some kind of insane lefty fantasy rather than observable reality. There are several parallels between the Tory plot to carve up and privatise the English NHS against the will of medical professionals and public, and the Tory plot to carve up and privatise the entire English education system against the will of the teaching profession and the public alike. 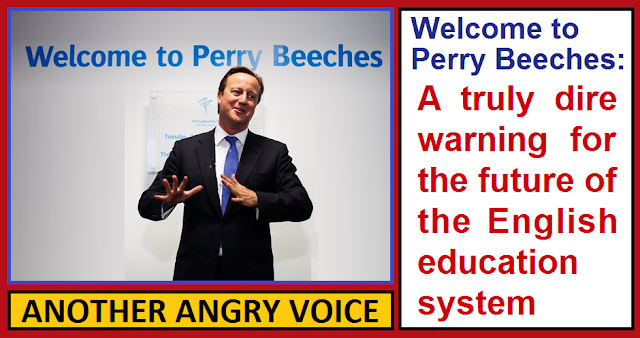 Tory academies and free schools are allowed to employ completely unqualified teachers. The carve up of the education system into the control of numerous private sector academy chains (many owned and operated by major Tory party donors) allows wages and working conditions to be undermined and will eventually be used by the Tories to rule out coordinated industrial action by teachers. The only difference seems to be that George Osborne and Nicky Morgan are so full of hubris that they were unwilling to continue with their slow and steady approach that has already seen 5,000+ schools handed over to shady unaccountable private sector operators and chose to announce the forced privatisation of every school in England by 2022 as part of George Osborne's 2016 budget of failure. 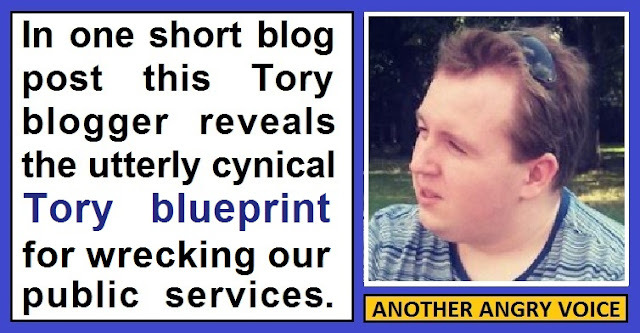 The Tories are usually very reticent about explaining their true intentions, but occasionally one of them lets it slip. One example is the vice-chair of the Conservative Health group Paul Charlson explained that abandoning universal NHS healthcare for a fee based system "would be political suicide" unless "there was a feeling in the country that the health service was falling apart" which explains the constant barrage of right-wing propaganda about how crap the NHS is. This "How a government can beat the BMA" blog post from Henry Hill is in a different league. It doesn't just accidentally let a piece of Tory ideology slip out, it clearly explains the Tory blueprint for tearing apart our public services, repressing workers' rights and wages and diluting the workforce with unqualified labour, as well as openly displaying the disgusting class war mentality and utter contempt for working people that is so rife within the Tory party. One of the most appalling measures contained within George Osborne's 2016 "Budget of Failure" was the announcement of the outrageous Tory policy of force privatising every publicly owned school in England into the hands of unaccountable private sector pseudo-charities (many owned and operated by major Tory party donors). Forcibly taking schools out of local authority control (even if the local community strongly opposes the plans) and handing them over (property deeds and all) to the kind of people who are queueing up to get their hands on chunks of free infrastructure and big slices of the taxpayer funded education budgets is an appalling idea. The fact that these academy chains are pretty much impossible to remove once they've been gifted control of the school (no matter how poor the results, or how much fraud is going on there) is one of the major objections, several other serious objections are detailed in this article. Just a week after the Tory plot to privatise every publicly owned school in England was unveiled a damning report into the Perry Beeches academy chain (which runs five schools in Birmingham) was released. Perry Beeches diverted almost £1.3 million in taxpayers' money into secretive off-the-books payments to a company called "Nexus Schools Limited". Financial fraud was committed because payments to Nexus were not included in the academy chain's 2013-14 accounts. Nexus subcontracted work the school gave them to a company called "Liam Nolan Limited". The sole director of Liam Nolan Limited is one Liam Nolan, who just happens to be the Accounting Officer and Chief Executive of Perry Beeches Academy Trust! Liam Nolan did not register his interests in "Liam Nolan Limited" and the Perry Beeches chair of governors also had an undeclared business interest with a director of Nexus Schools Limited. In setting up a circular off-the-books payment scam to pay himself an additional salary, the Perry Beeches financial officer Liam Nolan has clearly broken academies accounting rules and Charity Commission rules, yet the only punishment from central government is a written notice to improve, not a sacking or a criminal prosecution. Liam Nolan has already faced calls to resign after one of the Perry Beeches schools was put into special measures in 2015. His excuse for his track record of failure and financial mismanagement is that he's "not a business manager" just a "headteacher". Funnily enough he didn't use this "just a head teacher" line in 2014 when he was demanding an increase in his £120,000 per year salary! Perry Beeches was also made to pay back £118,291 of government funding after fraudulently claiming free school meal payments despite breaking the rules by keeping no records of kids receiving free school meals for six years. The Tory government is so unconcerned at this kind of failure and financial fraud designed to secretively transfer taxpayers' cash into academy executives' pockets that they're allowing Perry Beeches to open a sixth school in 2017! Privatising the entire English education system and putting people like Liam Nolan in charge of huge taxpayer funded education budgets sounds like a crackpot idea to most people, but the Tories love it because it fits in with their core ideology of transferring as much public cash into private pockets as possible. Back in 2013 (when Liam Nolan's off-the-books financial fraud was going on) David Cameron described the Perry Beeches chain as "a great success story and one to celebrate" and the former education secretary Michael Gove even praised the academy chain as having "excellent leadership and management"! The Tories aren't just OK with academy chain directors topslicing education budgets to pay themselves obscene six figure salaries and ripping off the taxpayer even more through opaque outsourcing frauds like the Perry Beeches scam, that's what the whole academisation agenda is actually all about. The Tories hate the public sector with a burning ideological passion. They don't want not-for-profit public bodies running schools in a democratically accountable manner, they want schools run by unaccountable packs of profiteers overseeing irremovable regional monopolies. The Tory spin on this story is that financial mismanagement like this can be picked up because of the financial rules they've drawn up for academy schools, but this argument is catastrophically undermined by two things. 1. Liam Nolan's off-the-books financial fraud went on for ages and was only investigated after a tip-off from a whistleblower that he was claiming a second salary from school funds. 2. There are plenty of other examples of financial mismanagement at other academy chains (like the Academies Enterprise Trust), and presumably a lot more that have gone under the radar because nobody in the know has tipped anyone off about it. An additional problem with this feeble justification is the fact that Laim Nolan is still in a job. What's the point of having supposedly rigorous financial rules if there is no punishment whatever for those who break them? Given the appalling scale of failure and financial mismanagement at Perry Beeches, one might have imagined that the director who set up the off-the-books circular payment fraud should be facing criminal charges for embezzling public funds, or facing the sack at least, however he's keeping his job and his six figure taxpayer funded salary and Perry Beeches are free to continue expanding their operations in Birmingham. This is the fanatically right-wing vision the Tories have for every school in England, whether schools want to be run by a bunch of topslicing Tory party cronies or not. If you oppose the plan to force privatise every school in England you can write to your MP to raise your concerns. There are also two petitions against the Tory plot to force privatise every school in England. One calling for the whole plan to be scrapped and another calling for a public inquiry and a referendum before such an extreme education system reform can go ahead. You could take a look at the anti-academies alliance website and follow them on Twitter or Facebook. 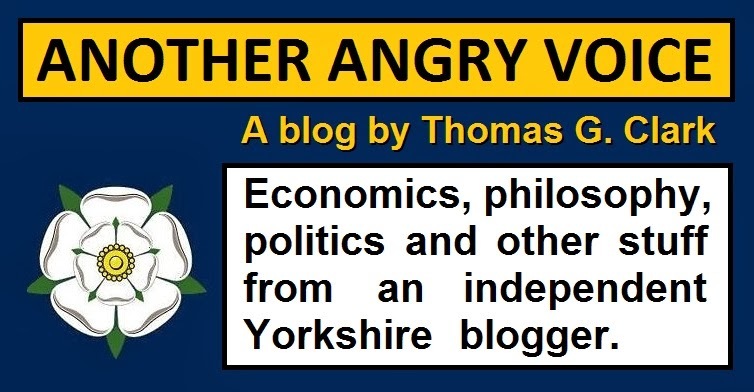 You could spread awareness by sharing one of my articles about the ongoing Tory privatisation of the English education system. This article, the one about the damage that has already been done or the one about the Tory plot to force privatise every school in England. The Tories chose to sneak out their U-turn on force privatising every school in England on the day after the 2016 elections; which, with everyone talking about the election results, is clearly a very good day to "bury news". The decision to exempt some of the best performing local authority schools from forced privatisation is only a partial victory. The Tories have already privatised over 5,000 schools into the hands of unaccountable private sector pseudo-charities like Perry Beeches so far, and they fully intend to privatise thousands more, and by force if necessary.